While we do not actively collect non-University publications, materials which complement existing collections, or are related to the social milieu of those involved with the University, do arrive at our doorstep. On this page you will find a few of these types of publications. The views expressed in the following publications do not reflect those of Dominican University staff, faculty, administration, or Board of Trustrees. See also Institutional Publications and/or Student Publications. The weekly Social Justice was founded by Father Charles E. Coughlin in 1936, as the publishing arm of The National Union For Social Justice. This organization, beginning sometime in the year 1938, was subsequently known as The Christian Front, though there is some overlap in the two organizations' timelines. Father Coughlin's ministry was based in Michigan, at the Shrine of the Little Flower in Royal Oak. According to the United States Holocaust Memorial Museum website, during its peak in the 1930s, Father Coughlin's radio program maintained a weekly average of 3.5 million listeners. As his radio pulpit grew in influence, so too did his anti-Semitic rhetoric, culmonating in Social Justice's serialization in 1938 of The Protocols of the Elders of Zion. Numerous organizations dropped Father Coughlin's radio program when he refused to provide drafts of proposed on-air sermons each week, and it was at this point that the National Union For Social Justice reorganized itself into the more outspokenly anti-Capitalist, anti-Communist, pro-Hitler organization called The Christian Front. The magazine Social Justice underwent several format changes, and we have examples of three such incarnations. 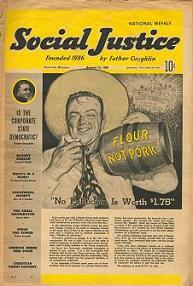 From May of 1936 until February 21 of 1938 the magazine was printed in black & white on newsprint. For a short time thereafter, until April of the same year, the magazine was printed on glossier pages, in color and stapled in the center. 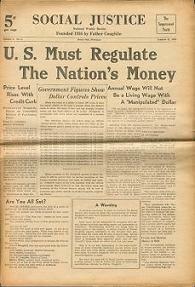 Beginning in May of 1938, Social Justice switched back to newsprint, but utilized block color printing.